International partnerships and networks are critical in this expanding world. New Century Management offers its organizational and leadership solutions to a worldwide audience. We are dedicated to building the capacity for growth beyond traditional country borders. 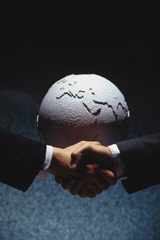 We have extended our consulting services and products with partnerships in Asia, Europe and Latin America. Our results are sustainable performance improvements to realize the economic potential of good governance. In addition, we have established academic research exchanges with our counterparts around the world to create knowledge-sharing networks. Preliminary resultsincluding practical management recommendations for motivating and retaining employeeshave been presented in England, Ireland, the U.S. and published in Europe.